Three voter ID bills failed in the House Consumer and Public Affairs Committee on Tuesday on party-line votes. The Democrats on the committee voted to table the three bills that would have required voters show photo identification, siding with the majority of the crowd at the hearing who said the bill would disenfranchise young, elderly, minority and disabled voters as well as costing significantly more than the Fiscal Impact Report predicted. The three pieces of legislation, all sponsored by Republicans, were tabled after a lengthy hearing process that included over half an hour of public comment. The bill sponsored by Rep. Dianne Hamilton (R-Silver City) would have allowed voters to use the last four numbers of their Social Security Number to prove their identity at the polls. The version of ID legislation sponsored by Rep. Cathrynn Brown (R-Carlsbad) would require a government-issued photo ID to vote in person and, to cast an absentee ballot, a copy of the photo ID would be required. The bill sponsored by Rep. James Smith (R-Sandia Park) was the result of work during the interim by county clerks and Smith. A complex bill, it was one that the county clerks would prefer to the other voter ID approaches, according to the county clerks association lobbyist Daniel Ivey-Soto. An array of organizations, ranging from the League of Women Voters to Disability Rights New Mexico to the Native American Voters Alliance, opposed the legislation on the grounds that it would disenfranchise voters and would do little to solve purported voter fraud. The majority of the crowd present in the committee room were in opposition. “If my constituents want me to introduce legislation to outlaw the bogeyman, I can introduce legislation to outlaw the bogeyman, or I can gently explain to them that the bogeyman does not exist,” Maestas said to laughter from the crowd. And Rep. Bill O’Neill (D-Albuquerque) said he the claims of voter fraud all seemed to be based on anecdotes rather than any real evidence. The state budget has cleared the House Appropriations and Finance Committee after a week of negotiations. The $5.6 billion budget cleared the committee unanimously. State Rep. Luciano “Lucky” Varela (D-Santa Fe) told New Mexico In Focus that it was important for the vote to be unanimous. “I had a concern that if it was not a unanimous vote, people would pick up on that,” the HAFC Vice Chair told In Focus. There was some delay after Republicans on the panel said they were not happy with the bill. NMPolitics.net reported last week that the objections to the bill came from the governor’s office. Martinez spokesman Scott Darnell told the website that he was concerned about some of the governor’s priorities being put “in a contingency status.” This would mean these might not get funded if the state’s revenues are lower than predicted. A committee analysis notes new language has been added that give the Department of Finance and Administration (and thus, Governor Martinez) authority to reduce allotments to programs if revenue falls short. That provision excludes Medicaid, developmental disabilities support programs, law enforcement, inmate management for the Department of Corrections and any agency with a budget of less than five million dollars in general fund appropriations. Further, representatives wrote in a clause that allows 2.5 million dollars to be used by DFA for critical public health and safety emergencies that would arise due to budget cuts. Another sticking point that delayed the hearing was money for so-called “below the line” funding for the education department. this would make it easier for Martinez to implement the changes that she has advocated for throughout her time in office. The budget will now head to the House floor where, if the HAFC vote is any indication, it should pass. However, the budget will then have to travel to the Senate which has traditionally rowed in its own direction, separate from the whims of the House or the governor’s office. Senate President Pro Tem Tim Jennings speaking on the floor of the Senate. Photo by Matthew Reichbach. Two state Senators stood on the Senate floor today and leveled criticism at the Governor’s office for its handling messages to the legislature, and at the Albuquerque Journal for a news story about the controversy. The issue of Governor’s messages has a bearing on on which bills can be ruled as germane for consideration during the session. In a 30-day session like the current one, the only bills allowed to be considered and acted upon are those that pertain to budget matters — or those that are related to any subject contained in a Governor’s message. Some lawmakers have said that the messages from Martinez are overly broad and would create a logjam of legislation during the 30-day session. Martinez was criticized last year for adding a large number of subjects to the official call for September’s special session which some legislators, predominantly Democrats, said would distract from the constitutionally mandated task of redistricting — a complicated job that happens only once every ten years. At issue in the Albuquerque Journal story was a quote from Scott Darnell, a spokesman for Martinez. “Despite our efforts to be accommodating, they have expressed a desire to be more restrictive and … we will work with that, but members who are unhappy with their bill not being heard would need to speak with their leadership – and not the Governor’s Office,” Martinez spokesman Scott Darnell said. Jennings explained that the Senate would not ask the Governor to “pull back” her messages to the Senate and issue new, narrower messages, but instead keep the original messages in place and that future messages be made narrower in scope. Jennings explained that the Senate Committee on Committees had already ruled legislation germane based on the original messages, adding that it would be unfair now to pull that legislation back. “Those messages had gone out and the cards had been played,” Jennings said. 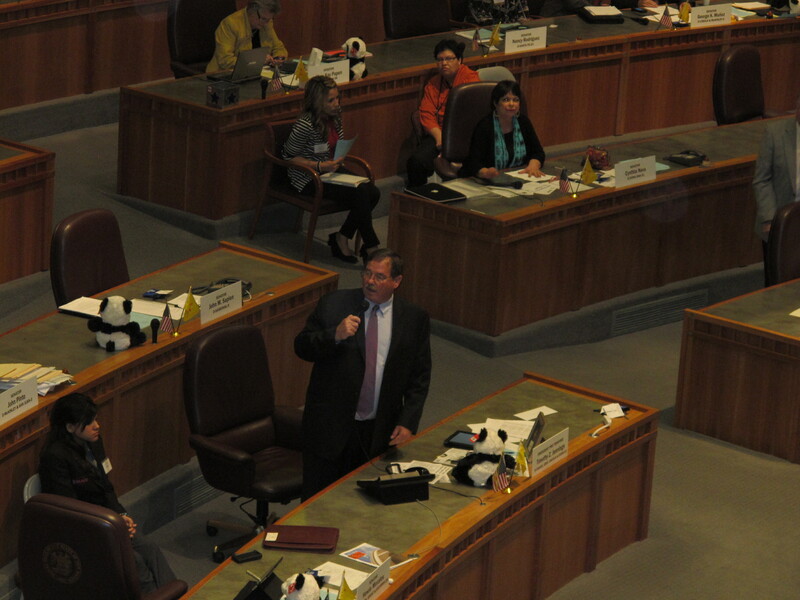 Sen. Cisco McSorley (D-Albuquerque) criticized the Albuquerque Journal for its story, accusing it of bias. Of course, legislators complaining about the way the media writes a story or about the Governor’s actions is not unusual. However, it does provide an interesting interlude during the early days of the session when most of the action is dominated by routine minutiae like passing committee reports and expressing support for the Boys and Girl Club of New Mexico. The Santa Fe New Mexican reported that even some in the Republican Party were critical of the Governor’s messages. McSorley noted that the Albuquerque Journal does not pay gross receipts tax. This brings to mind a move in Oklahoma to place a sales tax on on the cost of newspapers to pay for bonuses for National Board Certified teachers. Over 200 bills have been introduced in the Senate so far this session — only a fraction of those will make it out of committee, let alone be passed along fro Martinez’s signature — or veto. Hundreds of immigrants and supporters of immigrant drivers licenses rallied outside the Roundhouse Tuesday morning hoping to send a message to Gov. Susana Martinez. The rally, so far the largest at the Roundhouse in the 2012 session, included support from the Catholic Church and organized labor. A theme among the protests was that keeping the current drivers license policy promotes greater public safety by giving law enforcement a current and complete database of driving and other offenses. 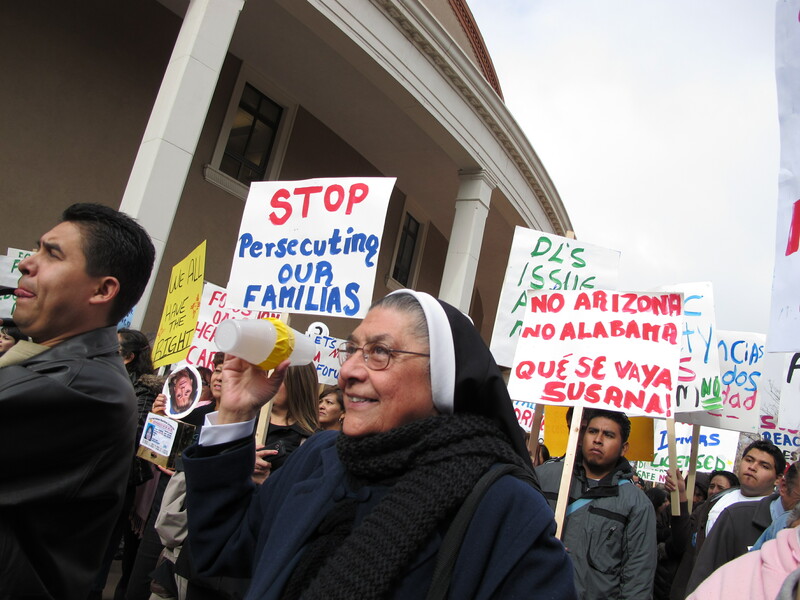 The Catholic Church has been a staunch opponent of the movement to repeal the law that allows undocumented immigrants to earn New Mexico drivers licenses. Allen Sanchez, the Executive Director of the New Mexico Conference of Catholic Bishops, echoed his speech from a similar rally in September. Sanchez said that this is a “gospel issue” for the Catholic bishops in New Mexico and said that the legislature should instead be focused on other priorities during the session — notably funding schools and creating jobs. Daniel Manzano, Director of Policy and Communication for the New Mexico Coalition Against Domestic Violence, said that keeping drivers licenses for undocumented immigrants was important for his group for three main reasons. For example, it allows victims of domestic violence to be able to drive away from abusive husbands “safely and legally.” He also said that driver licenses would allow these women to be financially independent. He also said the drivers licenses count as a form of identification for the courts, which is necessary to get an order of protection. 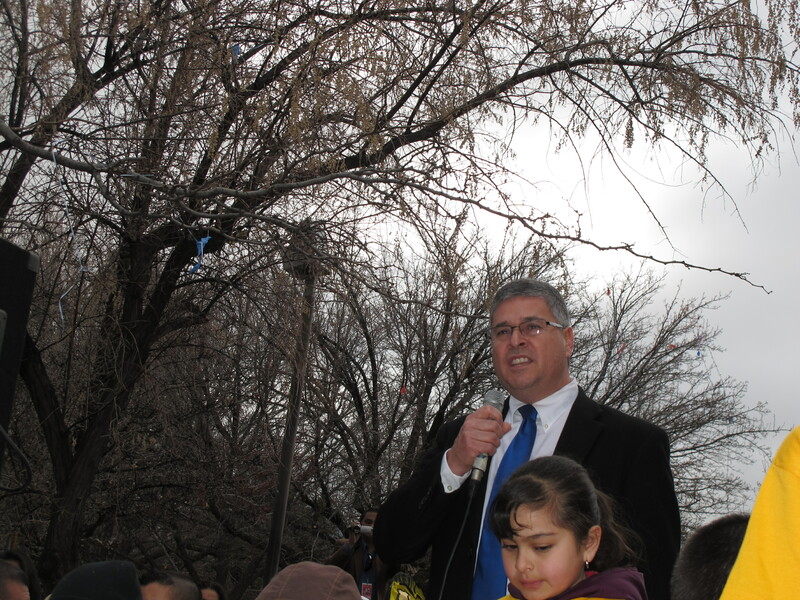 “The weather can’t even stop us today,” Manzano said, referring to the overcast skies and occasional flakes of snow dropping onto the large crowd. A clever noisemaker that was handed out to many protesters was made out of two plastic cups taped together with rocks inside. The most popular headwear at the rally was Los Angeles Dodgers hats. The Dodgers are popular among the Mexican-American community in large part because of Fernando Valenzuela, the legendary Mexican lefthander who won 173 games in 17 big league seasons.